No Cost Decorating ~ Switcheroo! 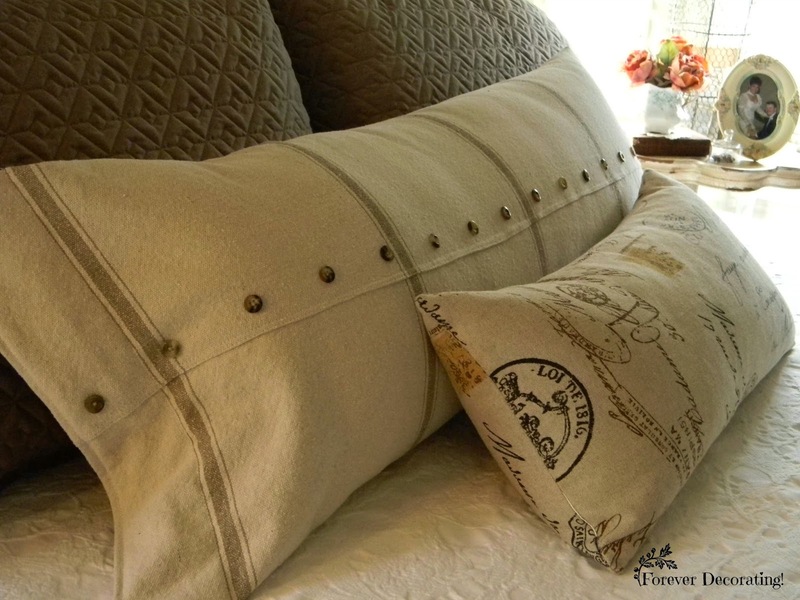 Yes, it looks lovely in it's presentation, but I needed to simplify my pillow life! I ending up doing a switcheroo! As you can see, in the above picture of the master bedroom, I have 10 pillows on my bed! TEN! The hidden first set are our actual bed pillows, then two brown king size shams, the two white euro shams, then two black and white regular size shams, then a long and a small decorative pillow! Can you tell I love making pillows? It's a sickness for sure! I also wanted a bit of a different look. It popped into my head that I could switch the bed skirt from the master and the large guest bedroom. So I did that first. It has a hint of green as do my lace curtains that I made in the master...so it would soften the look and coordinate. Now that the ruffle was on this king size bed, I re-used the brown king size shams, then made a new long pillow with a body pillow form. I purchased this fabric on Decor Steals and never used it. Now was the time. I love the way it turned out with various buttons sewn on, out of my button collection. Now this bed has 6 pillows instead of 10. The hidden actual bed pillows, the brown shams, the new body pillow and the long decorative pillow from TJ Maxx. But knowing that I only have to remove four pillows every night is a good thing! The chandelier side of the bed is my side. I was also tired of dodging the chair that was basically never used, so I moved it into the guest bedroom that I will show you in a minute. Instead, I put my cart in it's place and it holds some of the pillows that I remove at night. 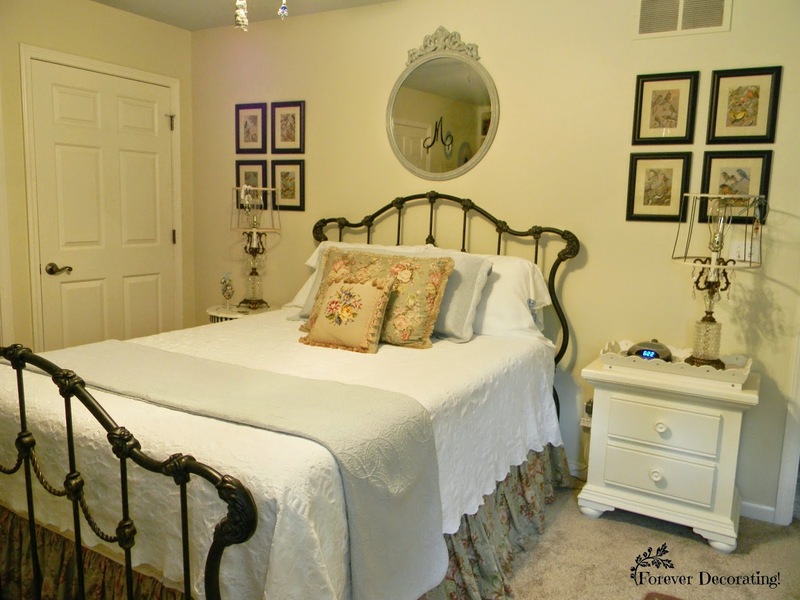 Now on to the changes in the guest bedroom! This is how it looked before the switcheroo. 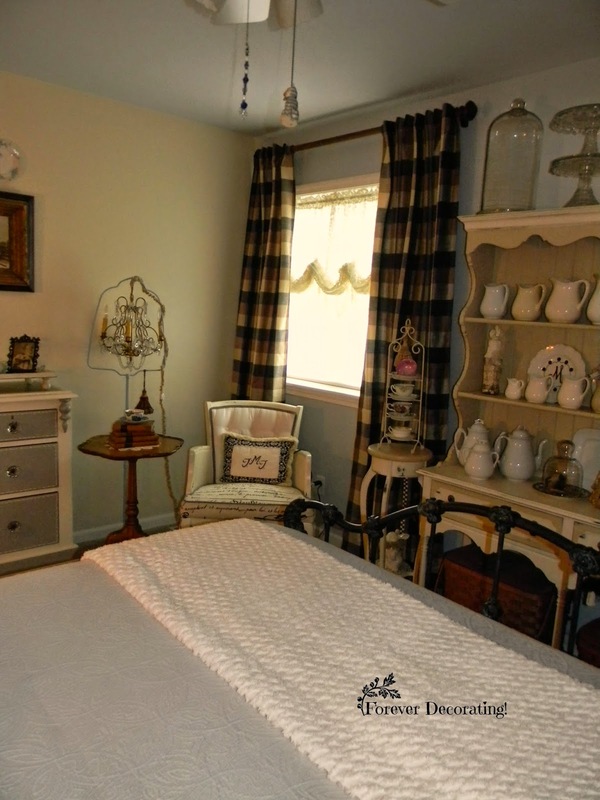 I had the two bed pillows, a single pale blue/gray matelasse sham in king size, then the green/floral sham that I made and a needlepoint decorative pillow. Now this was a non issue since I didn't have to remove these pillows every night...just when guests are here. But I needed that dust ruffle remember! This is a queen size bed and I just overlapped the bed skirt in the center so you can't really tell that it is too wide for this bed. 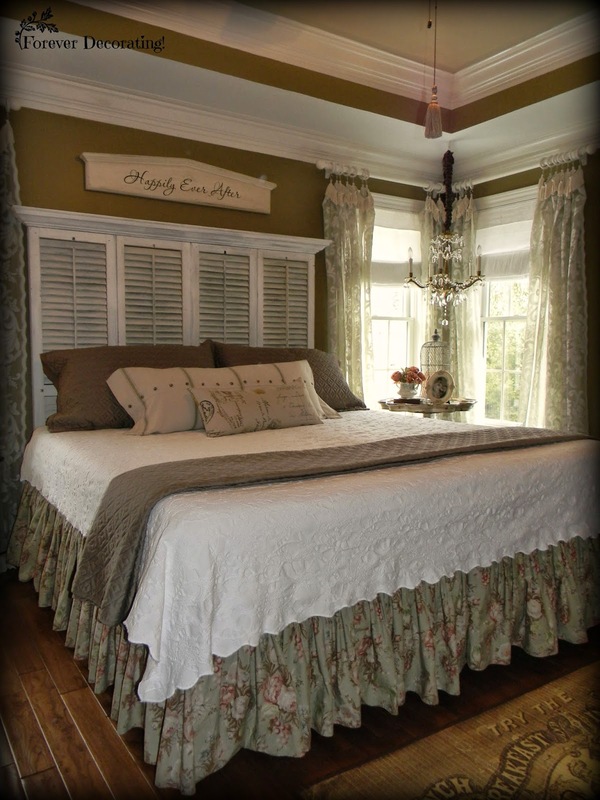 In case you were alert and wondering about the green/floral bed ruffle, it is a king size as well, and as luck would have it, I had done the same thing when I used it on this bed. 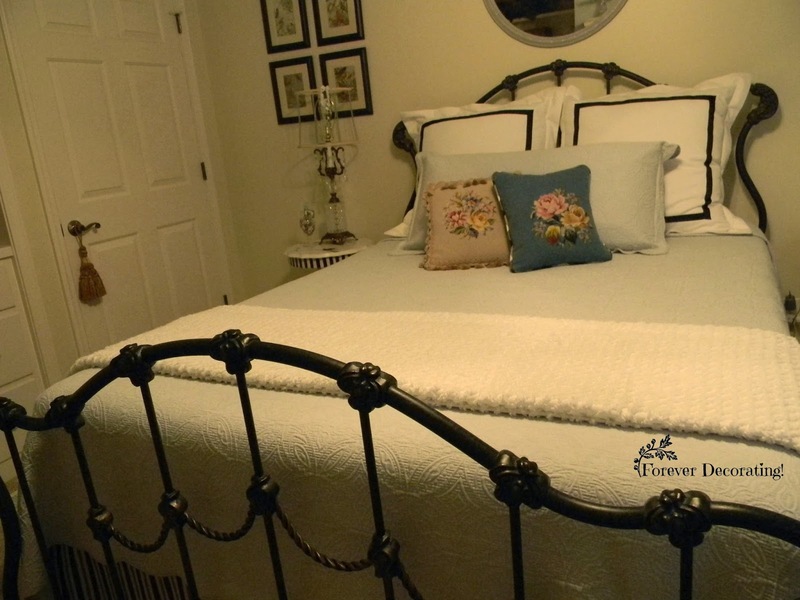 Initially, when I made the white euro shams, this bed frame was in the master but then we changed to a king size bed. 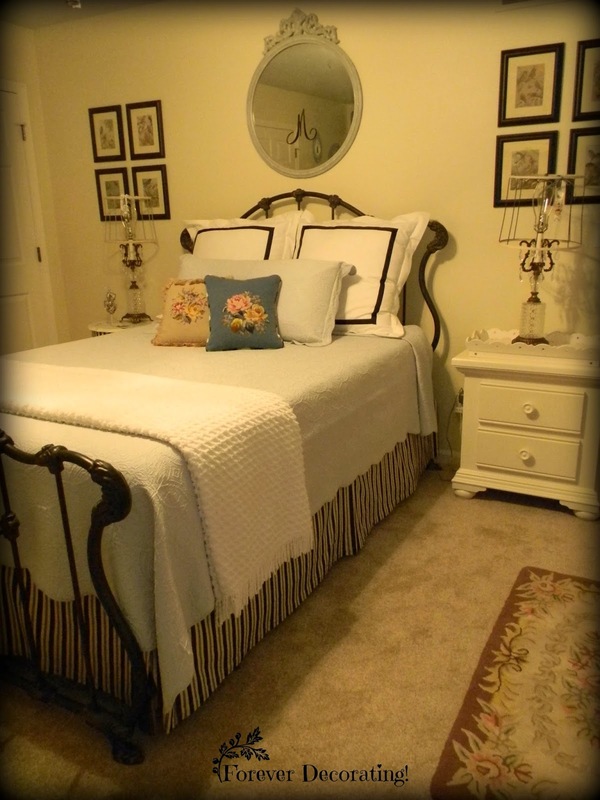 This bed frame went into this guest bedroom and so these euro shams fit better once again. 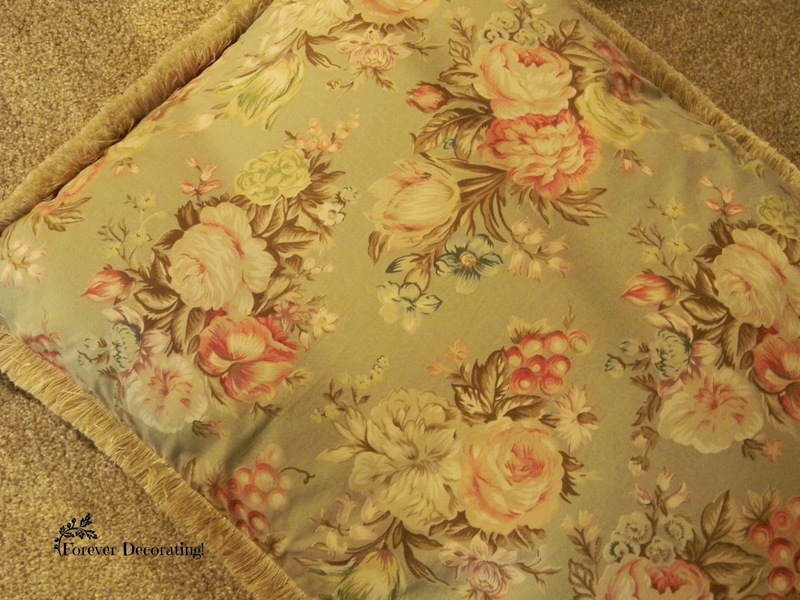 Basically, I removed two black/white regular size shams and the green/floral sham out of this scenario. It makes for a happier me! Love how it all turned out! I'm in agreement with the pillow dilemma and am now down to 6 as well! This cracked me up!! My daughter is so happy to discover she isn't the only one with a mother who has pillowitis! I cannot for the life of me stop making pillows! The switch was amazing for sure, but I liked the rooms the old way too. Good work! 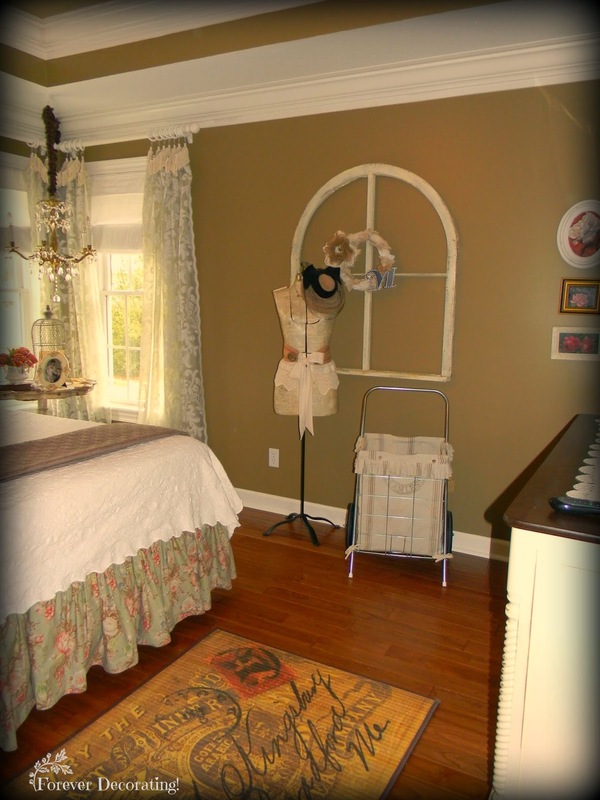 Love the ruffled skirt in your bedroom - it is a softer look! Your rooms look lovely! All the changes look wonderful. I was wondering about the white bedside table in your guest room. I have Holland House brand bedroom furniture but they don't make the style anymore and your table would match. Would you know where I could get one like it? Thanks for your help! Terry your bedroom looks beautiful!! 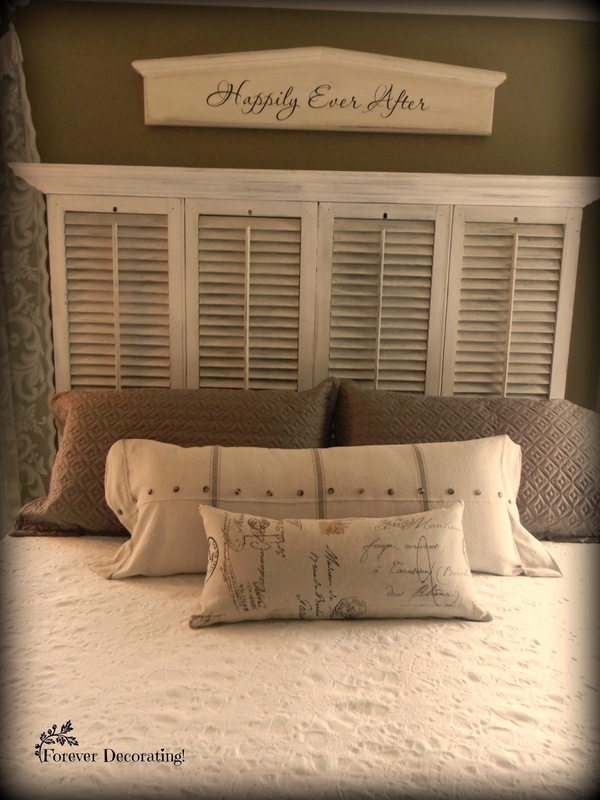 LOVE your bedding and that fabulous headboard...so pretty!! Great changes! Your room is wonderful and the long pillow you made is beautiful. I love the new look. Great to change things up for a fresh look every now and then. Love the pillows too. I have 9 pillows on my bed. We had 9 pillows on our bed and it became such a hassle to move them all to make the bed. We are down to 5 and it looks (and functions) much better. It looks lovely. I had an overabundance of pillows on our bed too. I recently swapped them out and now only have three accent pillows. Hugs! Beautiful job on both rooms. Just gorgeous! Great changes and both rooms look gorgeous. Thanks for linking to Inspire Me. I found you on All Things Heart and Home. I love your style! I will absolutely start following you as of today. I love those new streamlined pillows, very comfy looking, without being fussy! 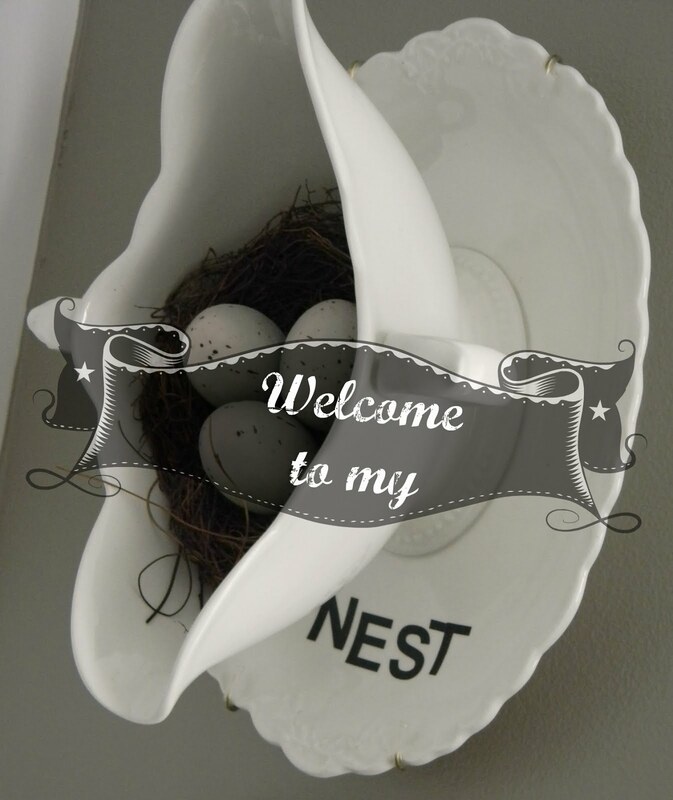 It's nice to meet you through the Home Matters Linky - I love your style! Looks great! Our dog is obsessed with chewing up pillows, so we have to put them in the closet during the day. Our bed never looks made! I love the changes. The rooms just seem to flow and come together with the new changes. BTW, I have the exact same teacup stand. Adorable. 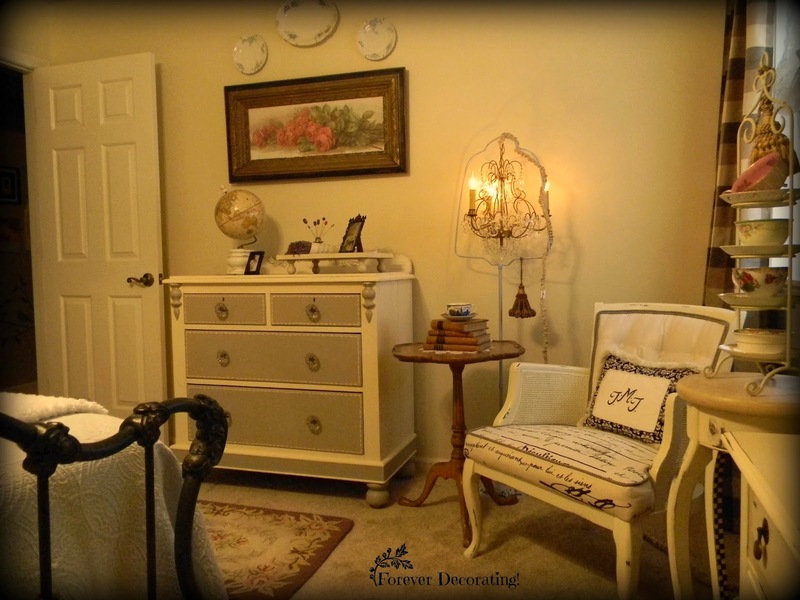 As much as I would LOVE to I dont have time to go through your entire blog so could you please tell me if there is a post about painting the ceiling in your master bedroom? Anyone? Anyone? 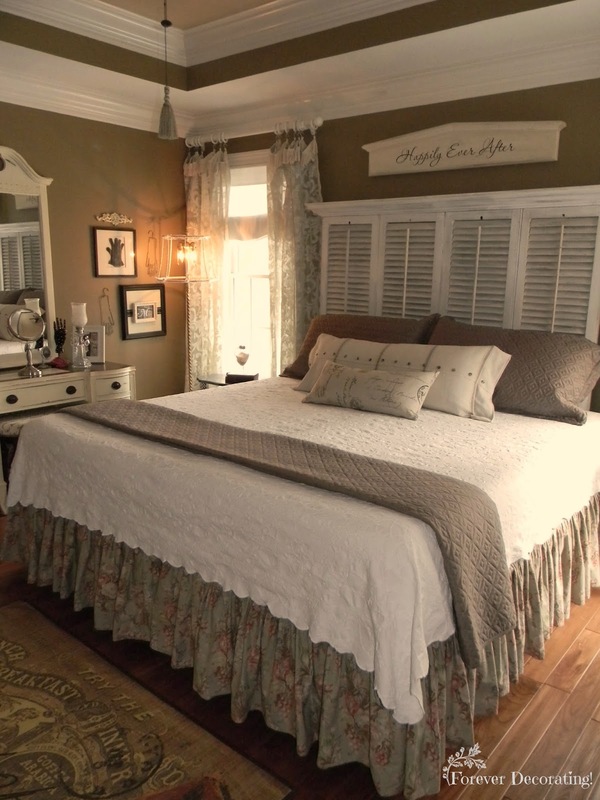 I really like the brown quilt with matching shams and the white or cream matelassé bedspread that you have on the bed in your master suite. Please share the sources...thanks! I love the new look in your room so much, Terry - it's very soft and relaxing looking, and the new pillow looks wonderful! I don't really love sewing, but since I have my machine out from making the dog pillow, I should take the time to work on a few more sewing projects. How did you create the shutter bed? I love it! You can see in this post how it was done. The rug with the script on it..... Where did it come from? I LOVE it!!!! !